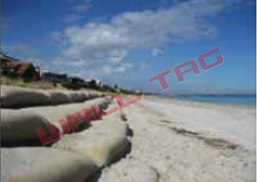 ELCOROCK® is a shoreline protection system utilising robust geotextile containers designed to be filled with sand (or other infill material), that are then placed to form a stable, durable structure. The versatility and durability of the ELCOROCK® containers allow construction of a wide variety of coastal structures - including groynes, walls,reef structures and other applications for marine and inland waterways. ELCOROCK® is a world-leading system, with structure built on coastal environment. The ELCOROCK® system is supported by extensive research, including design methods, durability reports and environment analysis.